beCPG is an open source PLM software for CPG industries : Food & Beverage, Cosmetics. This blog talks about Product Lifecycle Management. beCPG is surfing on the 5.2 Alfresco wave with the launch of its new version 2.2. 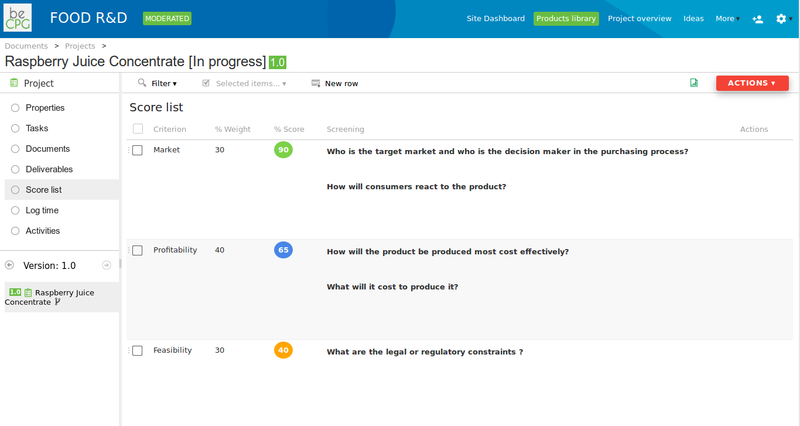 Focused on a meticulous products review, this latter will allow a simple access to your products and a fast understanding of the origins of your products’ properties ! Always in a willingness to help you optimize your time, some actions have been automated and search options have been reviewed and improved. beCPG, in phase with its time and the new regulations, has integrated the new method for the calculation of the 5C score in the version 2.2. 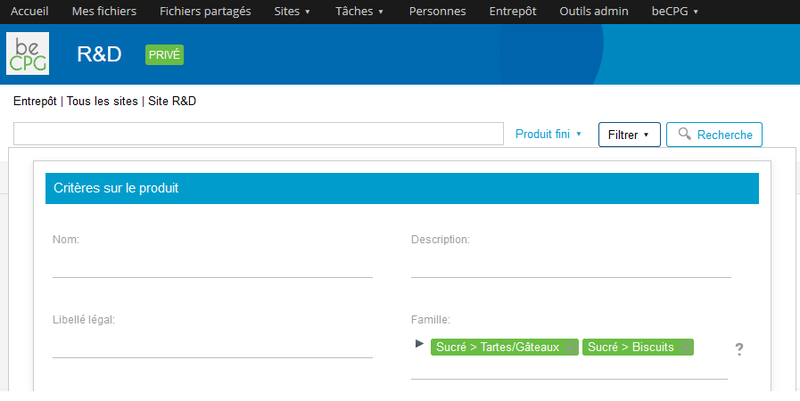 Sites dashboards are now optional which gives the possibility to sites managers to choose the homepage they want. 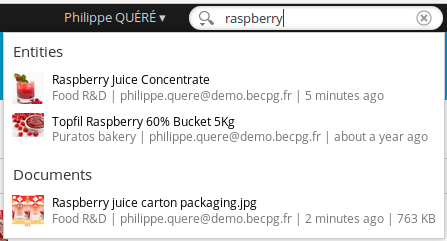 The "Live Search" appears, with the possibility to restrict the search to some sites for the purpose of refining it. How to distinguish yourself from the competition ? Based on the ruling of the 5th April of 2017, the new computation method of the 5C score has been integrated to beCPG software. As of now, you can put this new coloured logo as additional information to the nutritional declaration of your products. Thus, you’ll delight your consumers, avid of information concerning the food they eat ! This is how, with one click, you will distinguish yourself from your competitors ! 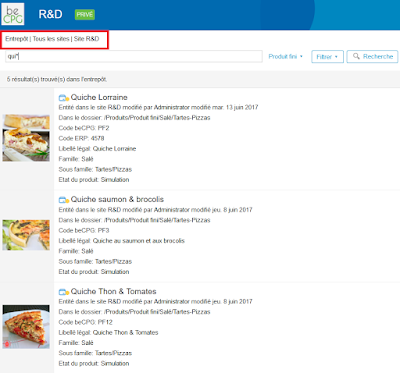 How to improve the traceability of your products? With the apparition of the sensitive version, you’ll store a precise historical of the previous versions of your products. The goal of the sensitive version is to be able to apply changes to a raw material but without using this new version in the previous versions of the semi finished or finished products in which it’s used ! How to keep an eye on the latest actions carried on your products ? An « Activities » list has been added to each entity in order to follow actions carried on by the site members on this latter ! Need to replace a raw material by another in many products and to be able to see the impact of this replacement on different and varied characteristics ? This is possible with the new functionnality of the change order 2.2 ! 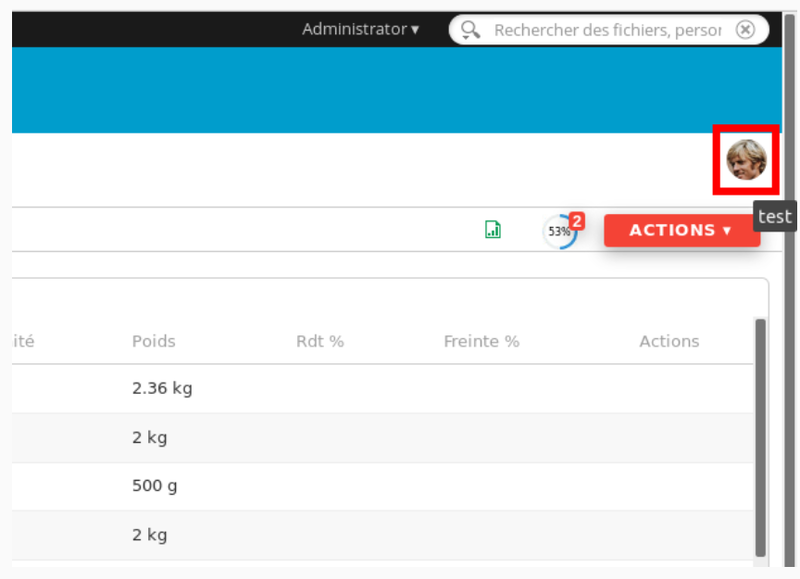 You are now able to evaluate the impact on nutritional properties, costs but also all the characteristics you've set by using your own formulas. Need to update a field presents on a huge variety of products ? The bulk edition of the new beCPG version will be very helpful. 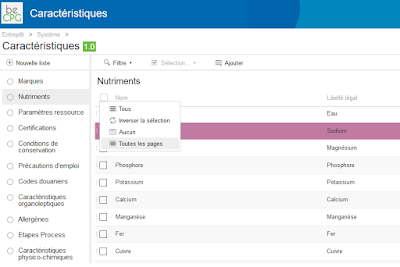 In fact, it will allow the selection of products in many pages and their grouped edition in order to modify a field such as the shelf life, familly etc. Endless characteristics’ lists ? Don’t panic, beCPG will allow you to easily navigate into these lists thanks to the sorting on many pages and the bulk edition. Moreover, the advanced search permits the investigation and the sorting of the results within more than one familie/sub familie. With the latest version of beCPG, the mandatory fields catalog is userfriendly so that you can easily modify it in order to define suitable advancement score based on the criteria defined by your company ! The magnifier 2.2 will improve your foresight and the knowledge of your products. Indeed, this latter allows the display of the previous year’s costs and the detail of the materials’ claims. 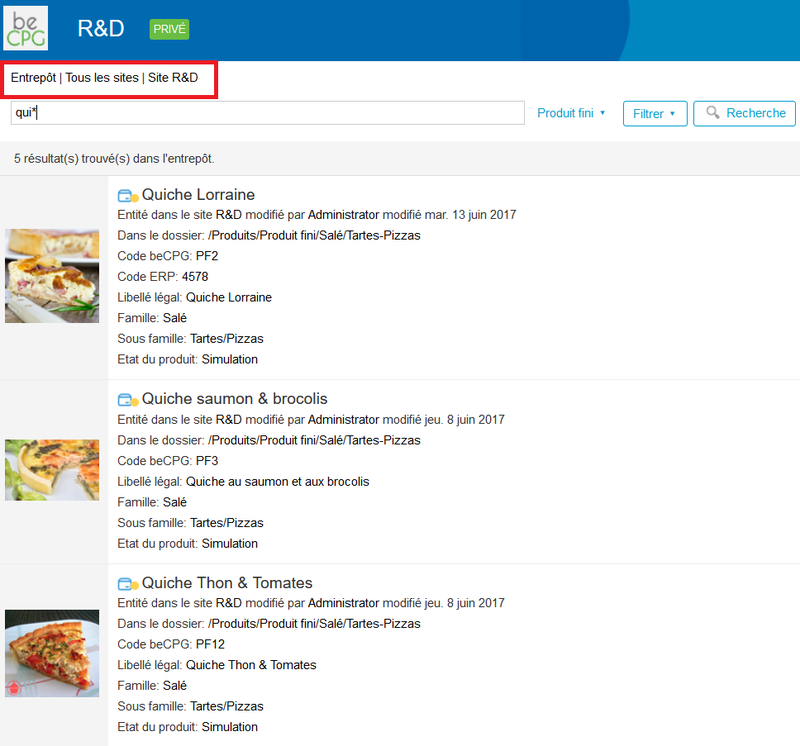 According to a recent survey led by IPSOS, more than half of the French people worry about their plate and would like to find out more about the origin of the food they eat : "French people say they don't have enough information about elements as essential as composition of the products (60%), exact proportions of the ingredients (60%) …"
In a willingness to affix a single nutritional information system on the front face of food packaging to answer consumer needs, a comparative study of four nutritional labelling systems has been launched by the health french ministry. This study showed the benefit and the efficacy of the Nutri-Score logo also called « 5C-Score ». Approved by the health minister Marisol Touraine, industrials will be able to attach it to the front face of their products food packaging, on a voluntary basis, from April 2017. Nutri-Score logo stands on the principles of a colour logo, classifying products into 5 categories (from A « good » to E « To be limited ») from an adaptation of the FSA score (Food Standard Agency). 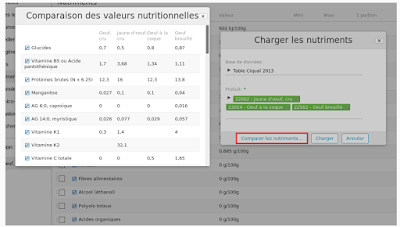 In 2014, we launched a first version of the Nutri-Score. Following the validation of the Nutri-Score, we have updated our nutritional labelling system. This new functionality will allow the industrials to evaluate their whole product range, to reassure their consumers and to stand out from their competitors. 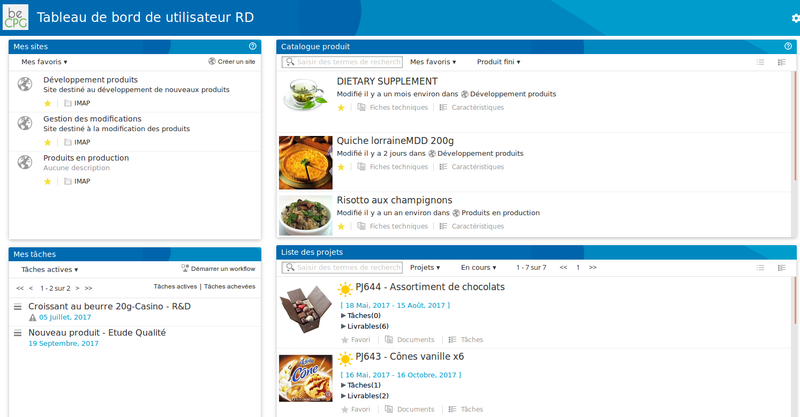 "It’s an efficient mean to improve the nutritional quality of the products and to profit from a favourable positioning on the future nutritional information system. You price your efforts of nutritional formulation !" Don’t undergo the regulation, use it as a springboard of growth ! beCPG, your products easily ! 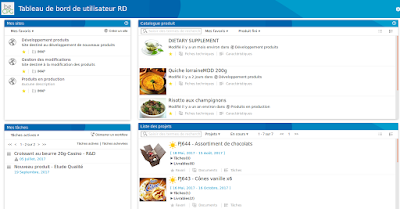 As “Le Figaro” mentions in its revue, in a stagnating market fragilized by price war (rates have decreased by 1.2% in 2015), industrials and distributors bet on new products to relaunch sales and straighten their margins. 2200 innovations have been introduced in 2016 during de SIAL, which represents an increase of 24% of the number of new products compared to 2014. A similar approach is presented by the Conference Board in Canada. 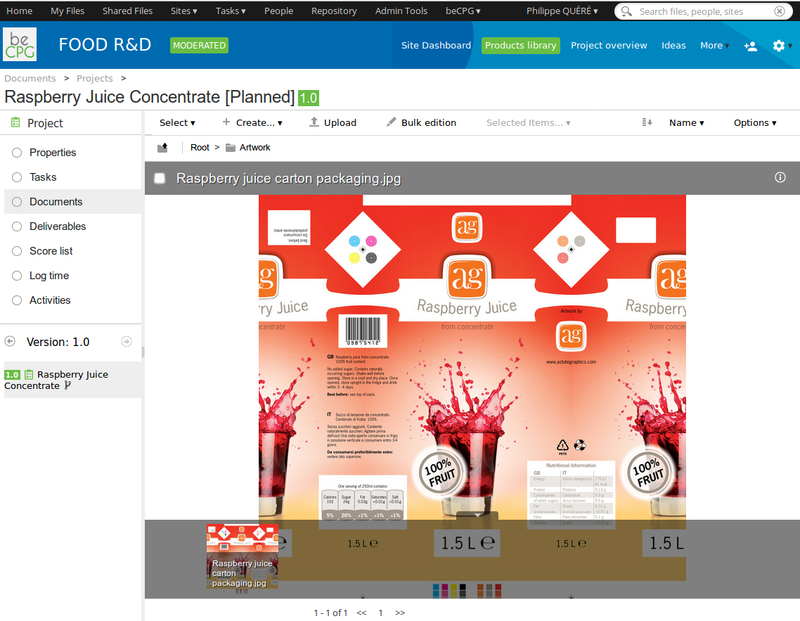 Thanks to beCPG software, we’re going to see how you can manage your innovation approach, notably the development of new products and new packaging in Food and Cosmetics industries. Why resorting to project management? 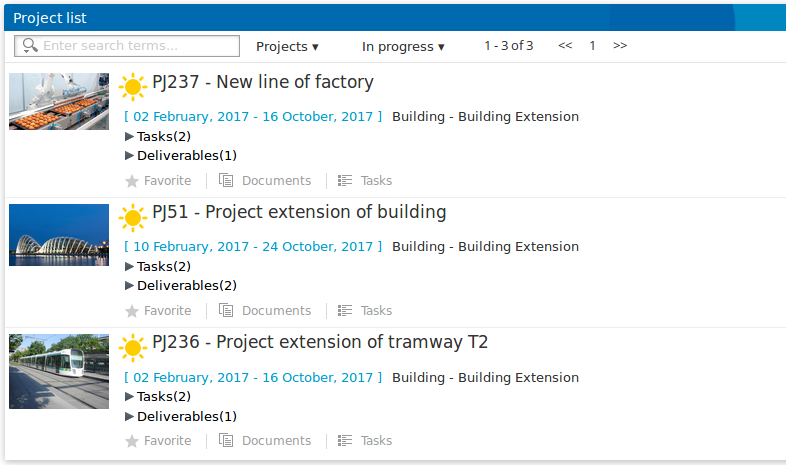 The schedule allows the definition of the project tasks by decomposing each of the phases in tasks and subtasks so that a visual representation of the project structure is possible (WBS: Work Breakdown Structure). It allows to communicate to each team member the goals and the roles of everyone. Thus, everybody is on the same page. 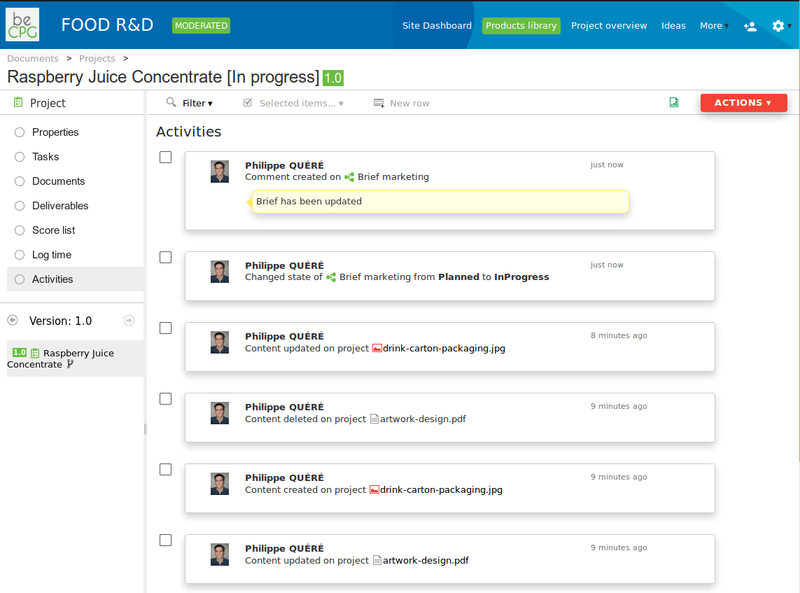 When a task starts, its actor is notified by workflow and by email with a description of what he has to do and with links to deliverables he has to achieve. 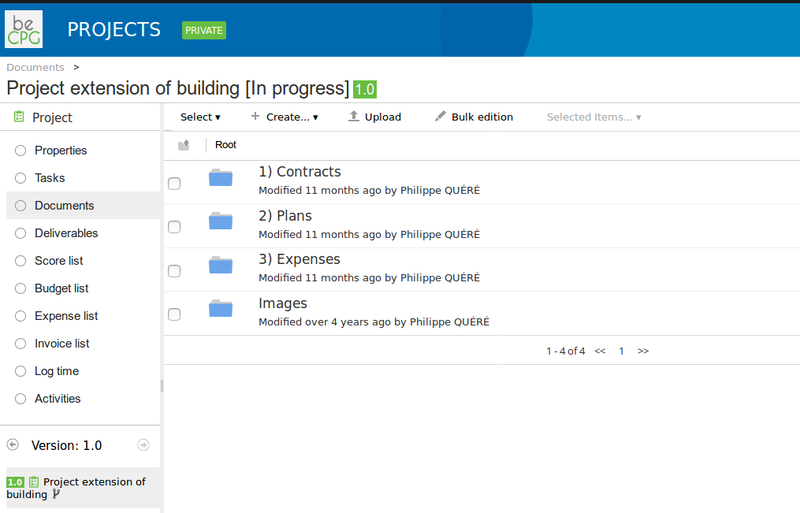 These workflows are configurable without development by the project manager. Each project is evaluated according to criteria defined by the project manager. 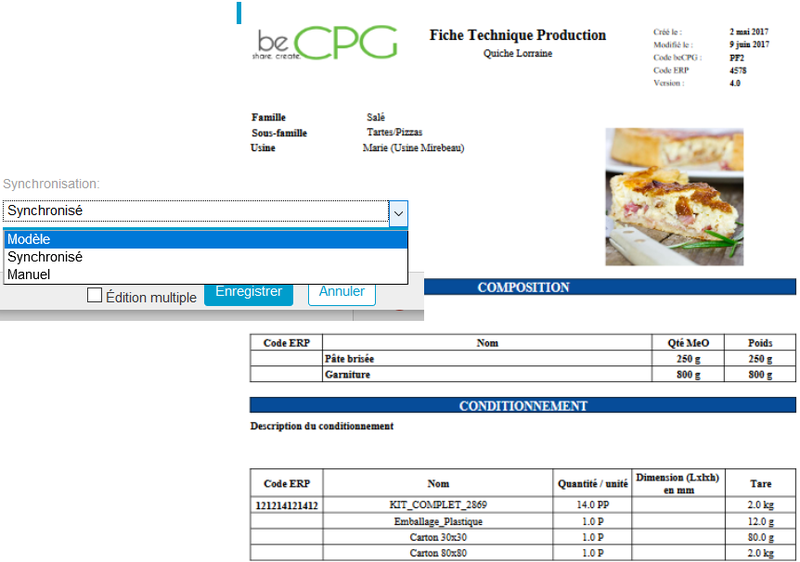 The beCPG software supplies a formulation module to calculate allergens, ingredients, nutrients, costs and allegations of the product from its recipe. 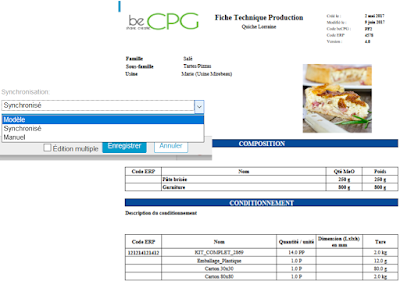 As soon as regulatory data and costs are calculated by beCPG, technical sheets are generated automatically, for example, le technical sheet for the client and the factory sheet. Document management allows the storage of all the documents linked to the project: brief marketing, formulations, technical sheets, trial results, ready for printings and so on. Documents are classified as folders and subfolders according to the record classification determined by the project manager. Users can consult easily the documents thanks to the inline preview and they can edit them in Microsoft Office or Google Docs. 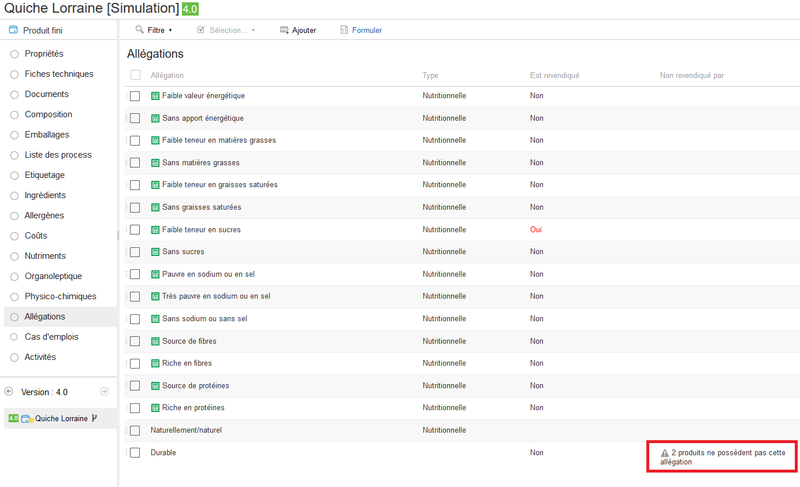 As soon as a document is modified, the previous version is archived in the versions history which enable to have a complete traceability of the modifications (who modified the document, when, why). Different views permit to view a document. To save some time during the creation of a project, it’s possible to create project templates to initialize the schedule and the record classification plan. The project manager has to keep in mind the budget allocated to his project. For that purpose, he can define the project forecast budget, expenses, incomes and follow the real budget. 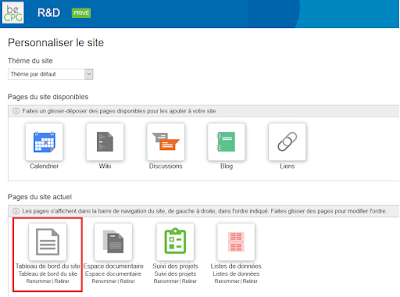 One of the most encountered problem for the users is the search of the documents. For that purpose, the research provides the preview of the documents. 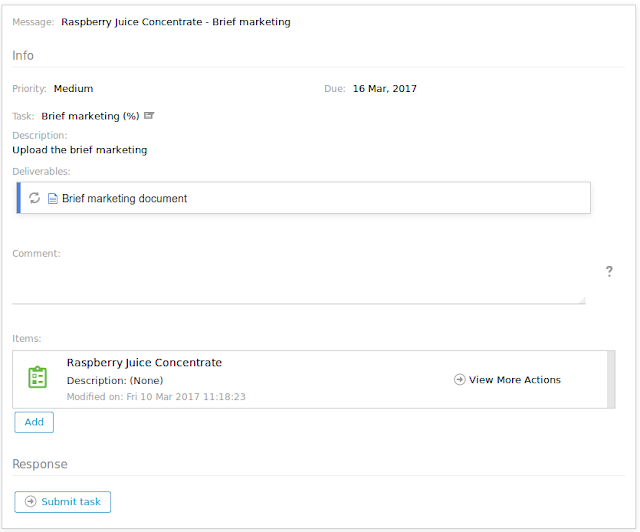 This latter allows the search into document’s metadata and into the document’s content (for example, in the text of a contract). 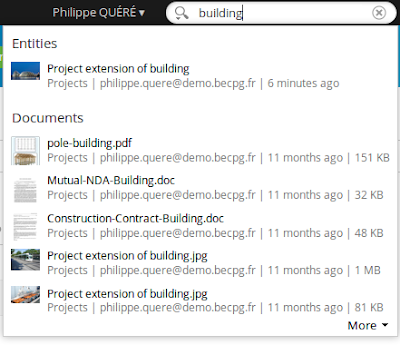 The user doesn't have to know the location of each document he’s searching for. 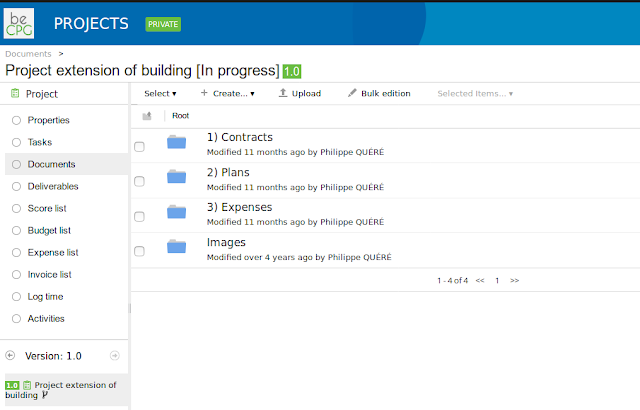 The activities follow-up allows to check easily the activity on a project (comments, documents modifications, change of tasks states and so on). The page project overview displays projects with current tasks, overdue, score, completion, products created, last comment, start and end dates. It allows project managers to track their projects during the review of project. 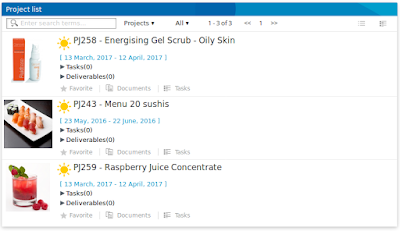 From this page, you can filter your projects and export them in excel. This article from “The Moniteur” spotlights that projects which exceed the forecast costs and miss the deadlines are not unusual. In fact, the complexity of these kind of projects is consequent because there are plenty of teams (often scattered), because of the variability of the exchanged documents and because trades must be well synchronized. To answer this problem, Alfresco and the beCPG project module provides an interesting solution which will help you managing your construction projects or even the extension of a production line in your plant. When a task starts , its actor is notified by workflow and by email with a description of what he has to do and with links to deliverables he has to achieve. 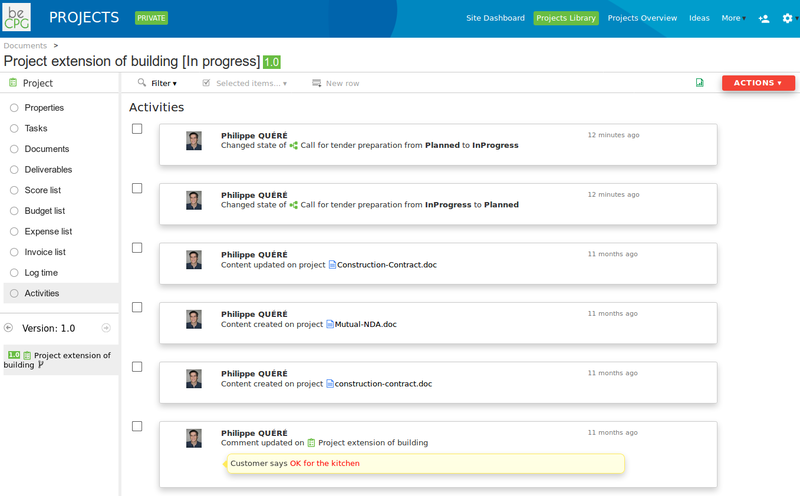 These workflows are configurable without development by the project manager. Document management allows the storage of all the documents linked to the project: contracts, plans, emails, pictures and so on. 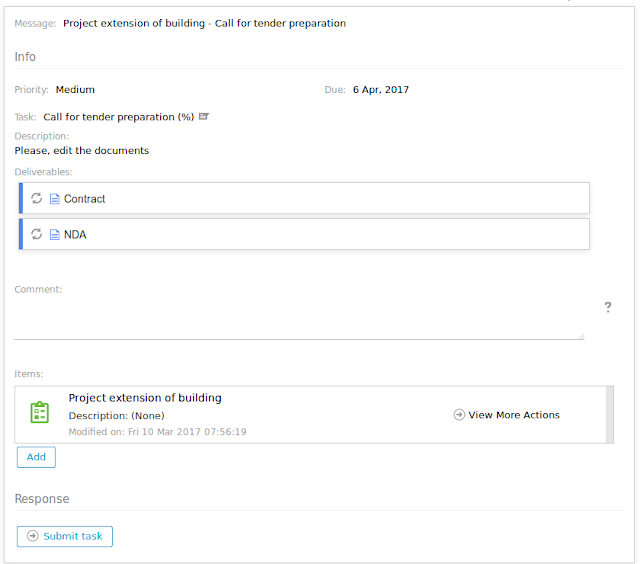 Documents are classified as folders and subfolders according to the record classification determined by the project manager. Users can consult easily the documents thanks to the inline preview and they can edit them in Microsoft Office or Google Docs. 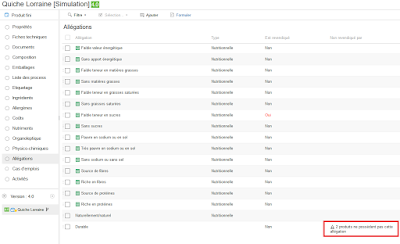 As soon as a document is modified, the former version is archived in the versions history which enable to have a complete traceability of the modifications (who modified the document, when, why). Different views permit the consultation of a document. 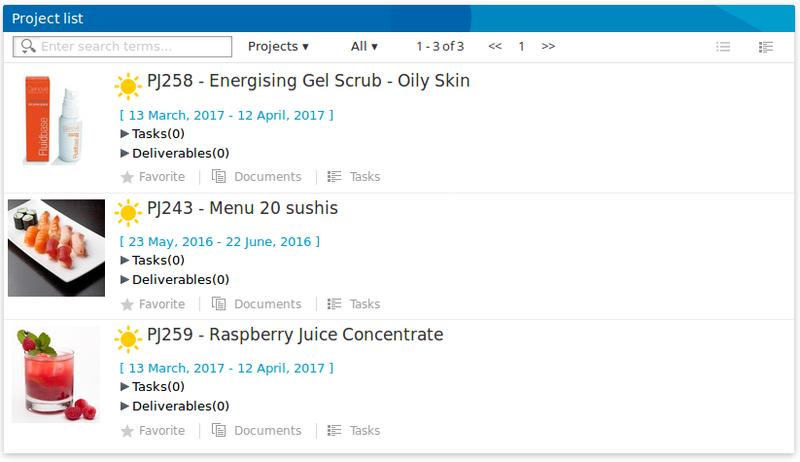 To save some time during the creation of a project, it’s possible to create project templates to initialize the schedule and the document library. The project management has to keep in mind the budget allocated to his project. For that purpose, he can define the project forecast budget, expenses, incomes and follow the real budget. 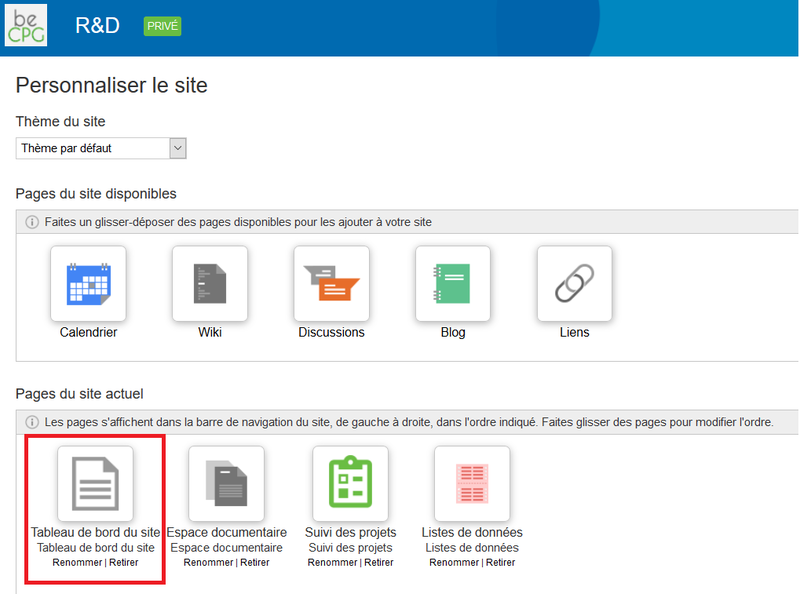 One of the most encountered problem for the users is the search of the documents. For that purpose, the research proposes the preview of the documents. This latter allows the search into document’s metadata and into the document’s content (for example, in the text of a contract). The user doesn’t have to know the location of each document he’s searching for. 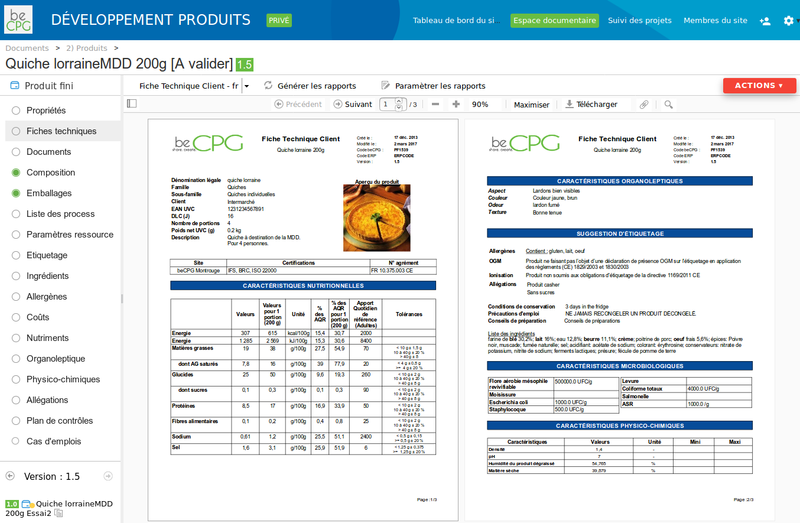 To build the version 2.1, beCPG considered the feedbacks of its 30 clients (SVA Jean Rozé, Loeul et Piriot, Les Délices du Valplessis, Boncolac, Valrhona, Daunat, etc...) notably by improving its user experience and by including latest innovation in its formulation module for nutritional and ingredients labelling. It is now easier to develop new products, to pilot R&D projects and to manage regulations such as regulation EU 1169/2011 or the decree n°2016-1137 dealing with the indication of the origins of milk and meats used as ingredients. beCPG is now based on a new technical foundation (Alfresco 5.1; Tomcat 7.0.62; Apache SOLR4; Java 8) and takes over MySQL 5.7 et Ubuntu Xenial. With a constant will of openness and transparency, this new PLM version is available in Open Source on Source Forge. Handling beCPG 2.1 is still simple as far as a virtual machine is supplied. Download the virtual machine here. 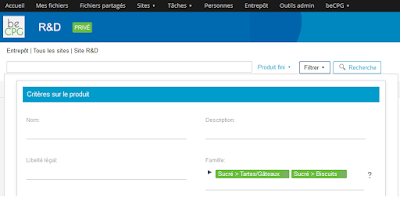 A new theme has been added to improve the user experience and provide a better visibility of the information. Reference daily intakes (RDI) percentages are now visible in the forms of gauges whose colours are associated to each nutrient. Consequently, it is easier to evaluate the respect or not of RDI. The new 2016 Ciqual Table is also available. Furthermore, it is possible to compare the nutritional values of your product with the nutritional values of one product of a nutritional database (ex: smocked or cooked variant). The headers of datalists are now fixed which allows you to keep an eye on datalist header while reading data of a long list. 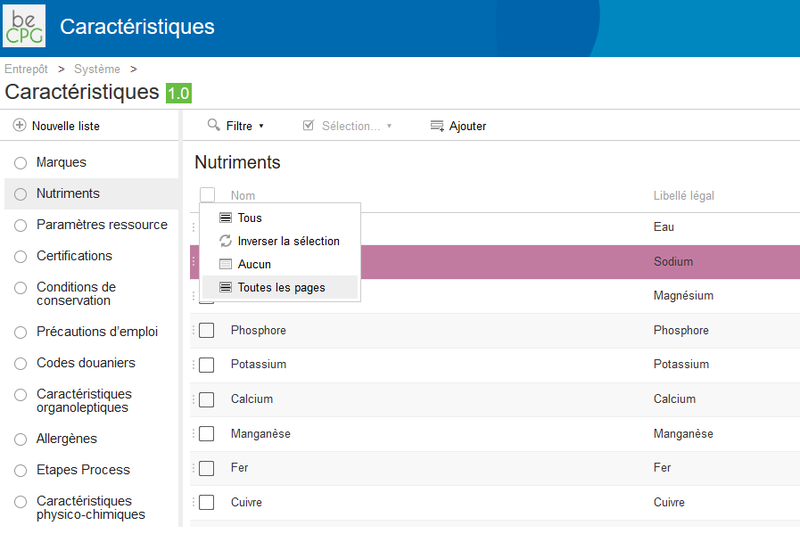 From the « Composition » view, it’s possible to keep a whole vision on the product by using personalized lists. Moreover, all the software’s notifications are centralized in this view. Finally, it’s possible to know users who are consulting the same product as you thanks to the display of their avatar on the upper page. Several persons can also modify the same product ! 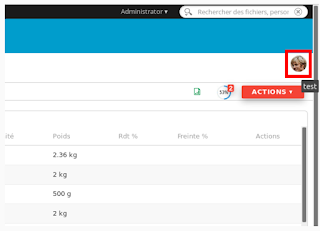 Different data must be filled on a product according to its recipients (client, factory, etc...), that’s why a products catalogue management module has been developed. This latter allows you to associate rules on properties of products. 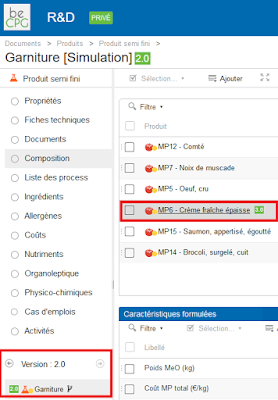 For example, on the client catalogue some fields must be filled such as the trade name, EAN and GTIN codes, or whether storage conditions, shelf life and much more. When some data are missing, warnings are raised. This allows the reduction of customer returns caused by errors on those data, thus, to save a considerable time. In addition, beCPG added a progress notion. It shows visually the product advancement and it is linked to indications which permit a fast visualization of missing points. This Product Information Management (PIM) ensures the quality and the wholeness of your product data. Download community version as of now or ask for a free trial. According to a study done by the AT&T research laboratory, poor quality data costs US businesses $ 600 billion annually. Beyond the quality of the data, it is important to know when a product can be distributed to certain recipients. Indeed, a product may be distributable to the client but not be ready for the start of production or publication on the website because it lacks some information. Catalogs for "Factory" and website will have additional information to complete. With these catalogs, it is possible to manage the conformity of the data entered. 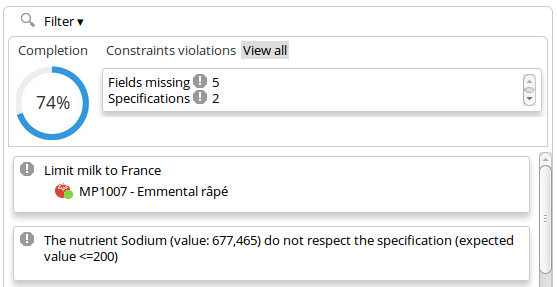 Some alerts are raised when some properties are missing. This results in reducing the number of returns due to errors in the data, thus saving valuable time. In addition, we also added a concept of advancement for a product. 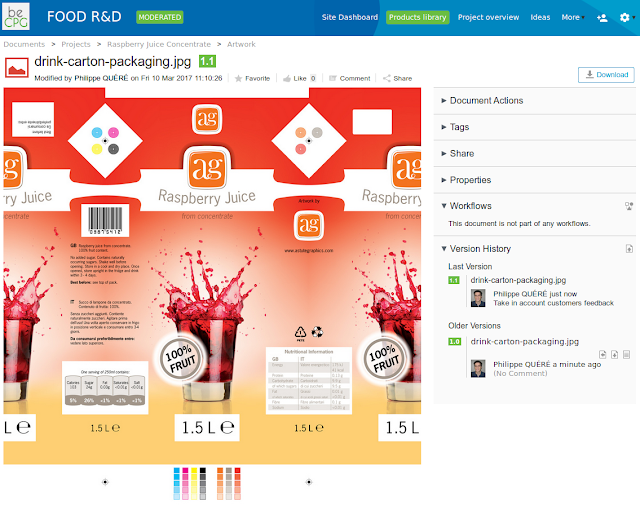 This concept translates visually that a product is more or less completed. It is accompanied by instructions to quickly visualize the missing points. 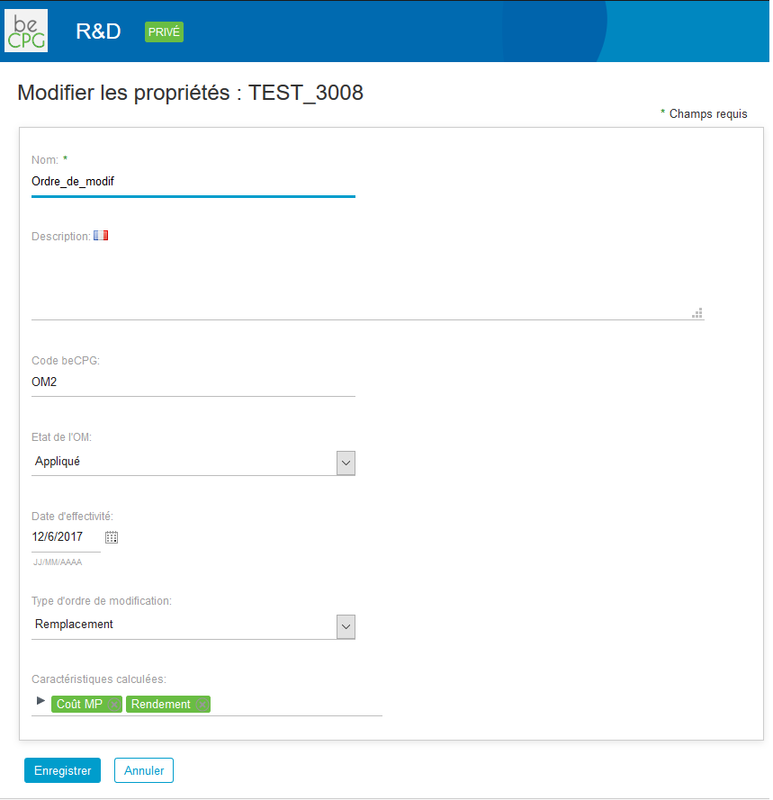 With this new module, beCPG provides assurance of the quality and completeness of your product data. You can say goodbye to incomplete or incorrect product sheets !